Riccardi is a high-end fashion retail store located on Newbury Street in Boston. They have been in business since 1978. Their main touchpoint is their retail store, but, they found that they needed to upgrade their online presence. 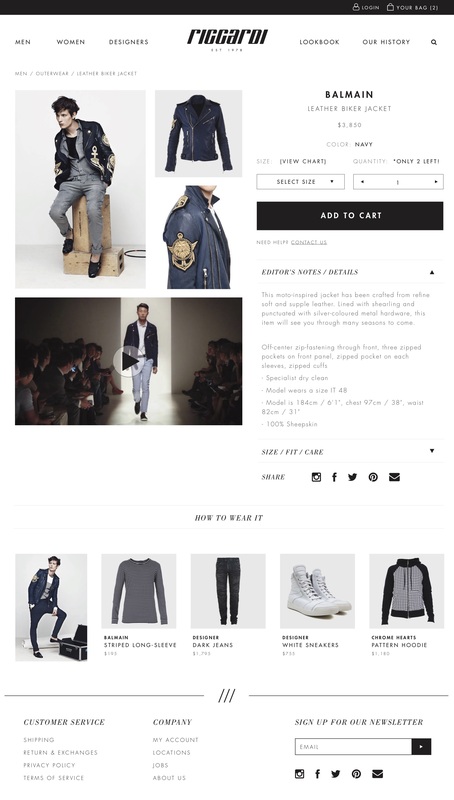 To create a unique Shopify E-commerce experience in order for Riccardi to sell online. Although Riccardi have been an established retailer, they did not have many branded materials or guides. I created a mood board of high-end fashion websites to help myself establish a coherent design aesthetic for the site. I was the UX and UI designer of the project. I created concepts and wireframes, as well as the user interface and design elements. I also coded the front-end of the website within Shopify using HTML/CSS, and with the help of a back-end developer, we were able to deliver a functional website within 4 weeks.